Our cruise to Alaska started in Seattle. Arriving a few days early, we were looking for something interesting to see and do. 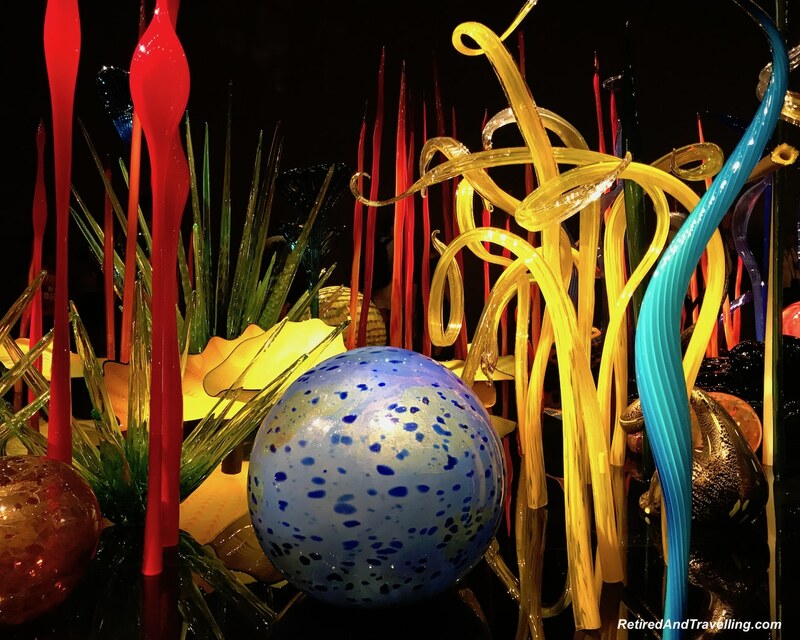 We decided to see the Chihuly colour and art in Seattle. 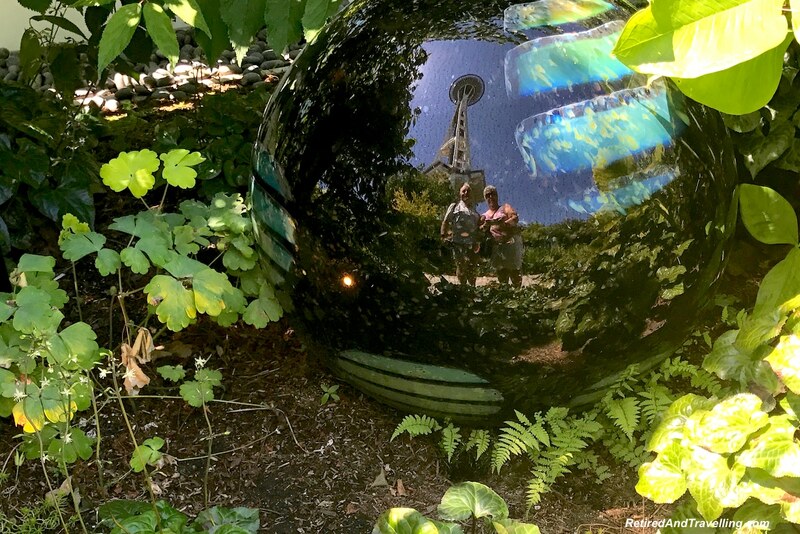 We got a combined ticket and enjoyed a trip up the Space Needle on the same day. 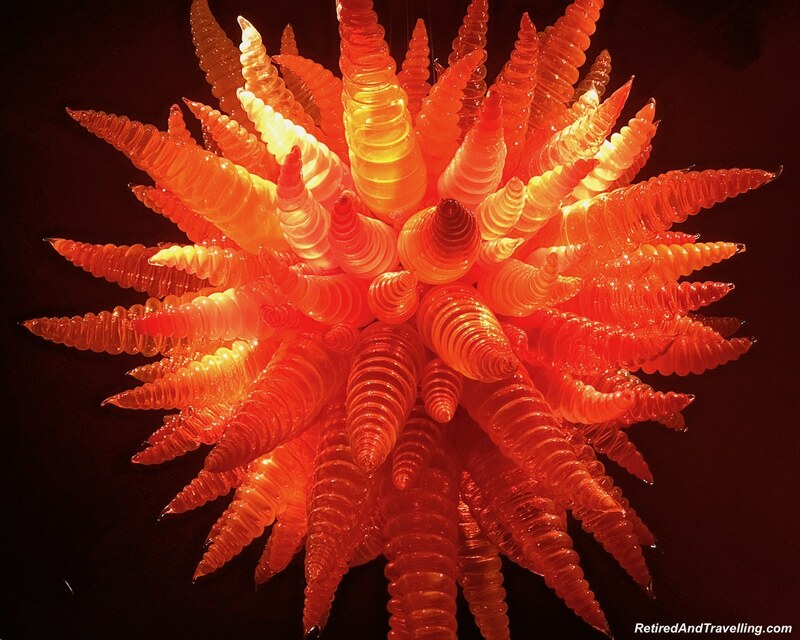 There was a large Chihuly exhibit at home in Toronto. We missed it! Our friends Pam and John (@Always5Star) were visiting from California and they saw it. Pam’s pictures teased me from the internet. 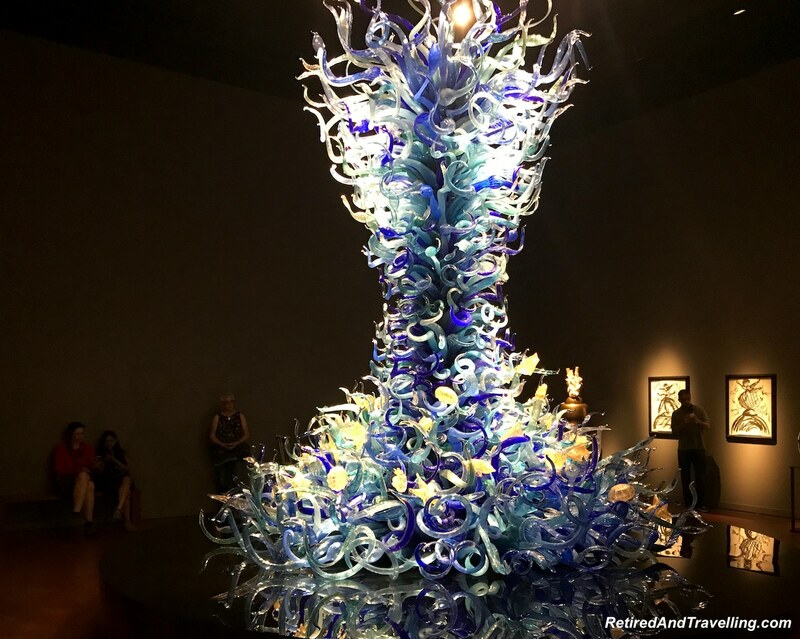 We were not going to miss the big permanent Chihuly Exhibition this time! There was a large sculpture in the centre of the Sealife Room. 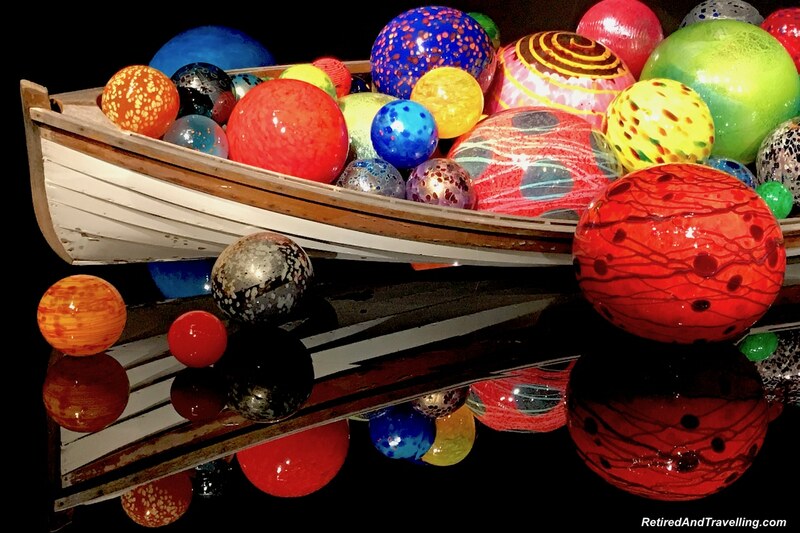 David spent his time entranced with photographing this sculpture from all sides. He totally missed the smaller sea life sculptures around the room! 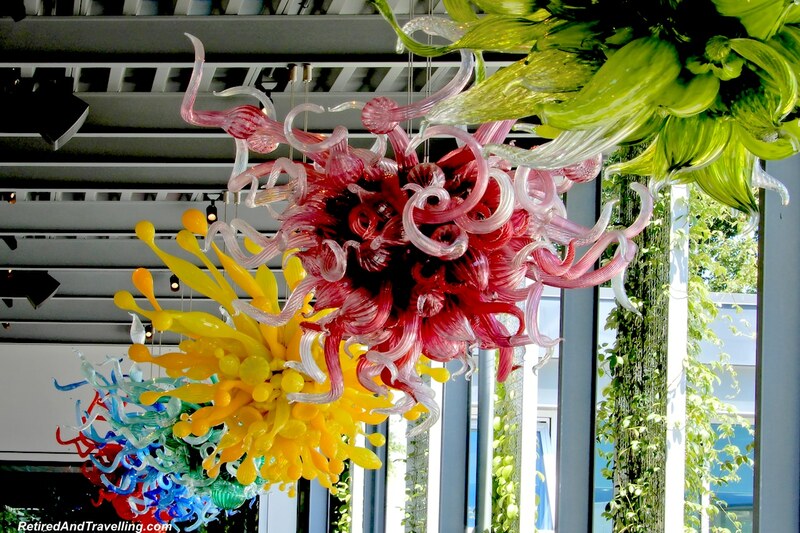 We spent a long time walking around and taking in all the detail in the Mille Fiori Room. We got a good overview when we stopped in the entrance or looked from one end. But as we walked around and looked closer, the intricate detail emerged. 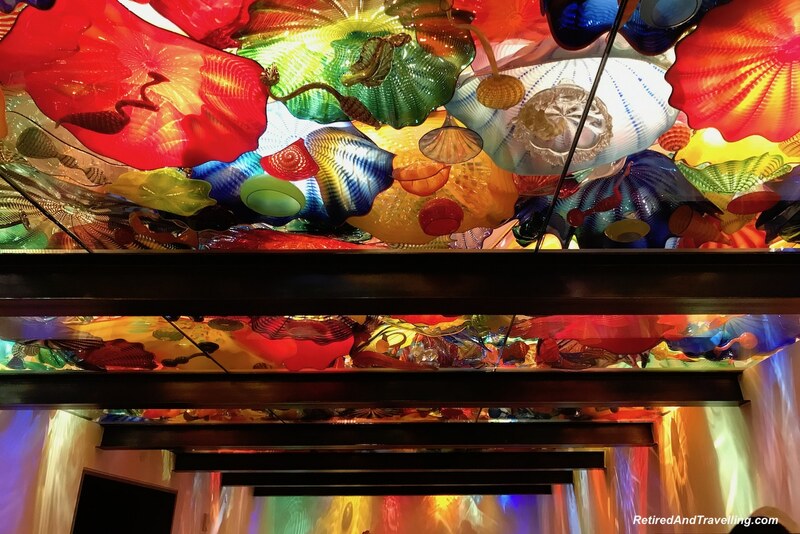 The Persian Ceiling Room had us looking up at an entire ceiling covered in Chihuly colour and art. The ceiling reflected down the walls. If you looked very closely you could see small figures hidden in the bigger picture. The Chandelier Room provided an interesting display of very unusual chandeliers in a range to colours. Each was very different and looked different again when you came at them from a different perspective. The indoor exhibits moved from room to room. Each of the rooms had a different theme. 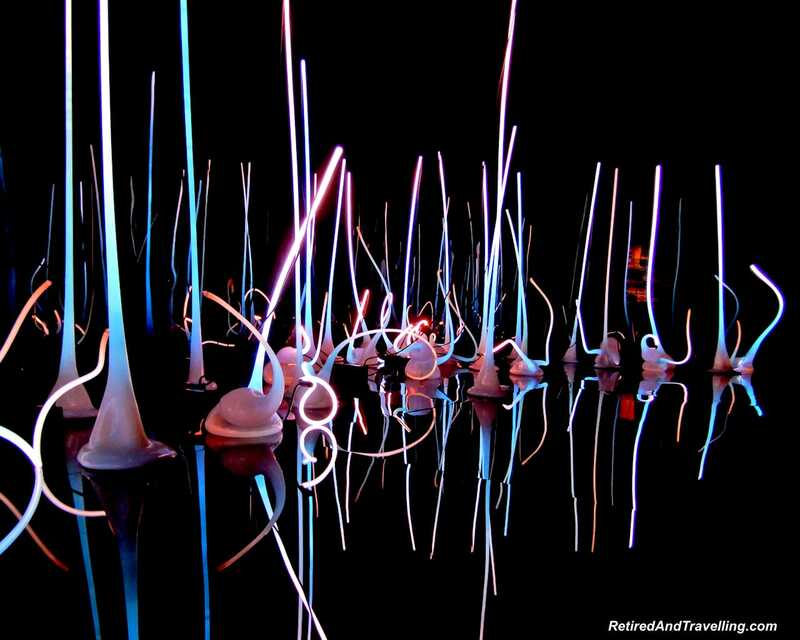 The exhibits showed different displays of Chihuly colour and art in Seattle. 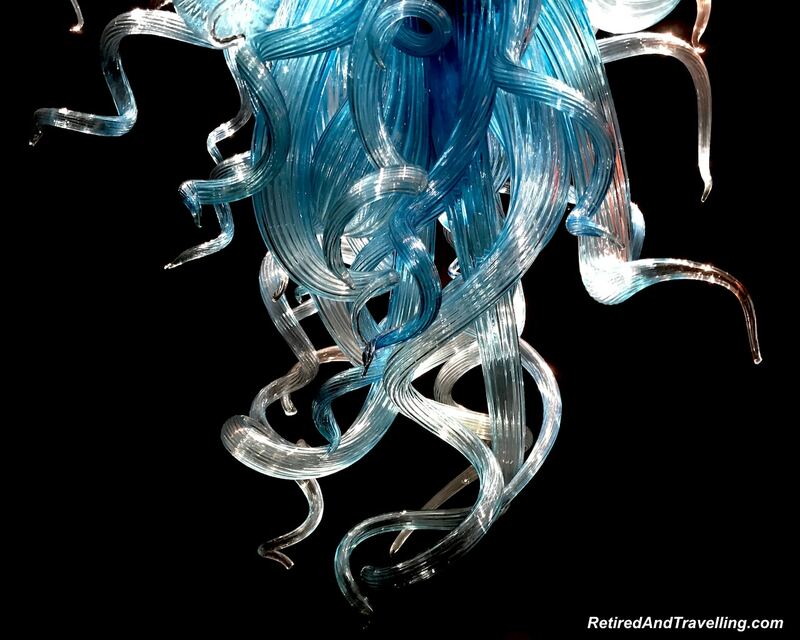 It was fascinating to see the range of the artistry of glass. 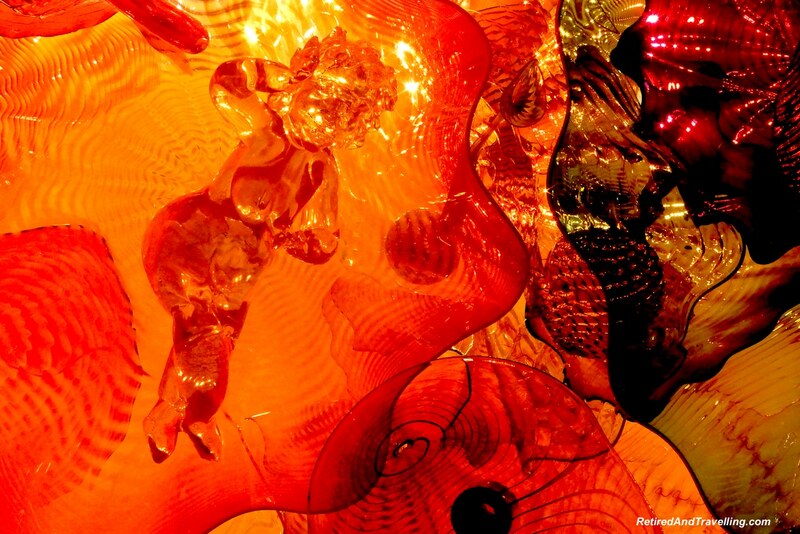 We started in the Glass Forest with the colourful reflections. 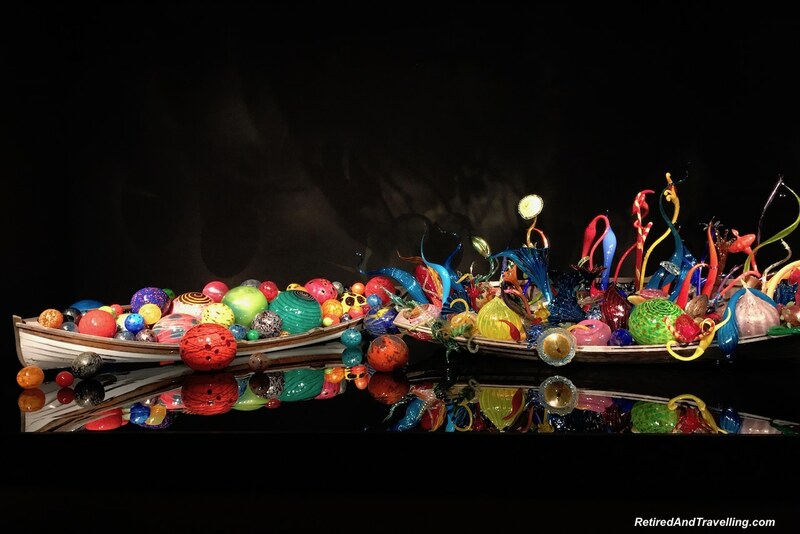 The Ikebana and Float Boat display provided rich detail for two boats filled with artistically styled Japanese fishnet floats. The colours were rich. If we caught the angle just right, we got the most interesting reflections. 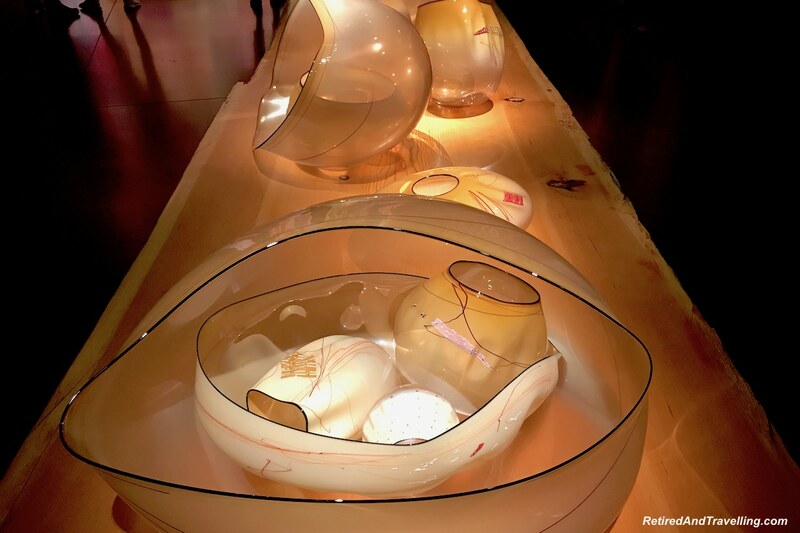 The Northwest Room showcased some interesting smaller glass sculptures and bowls. 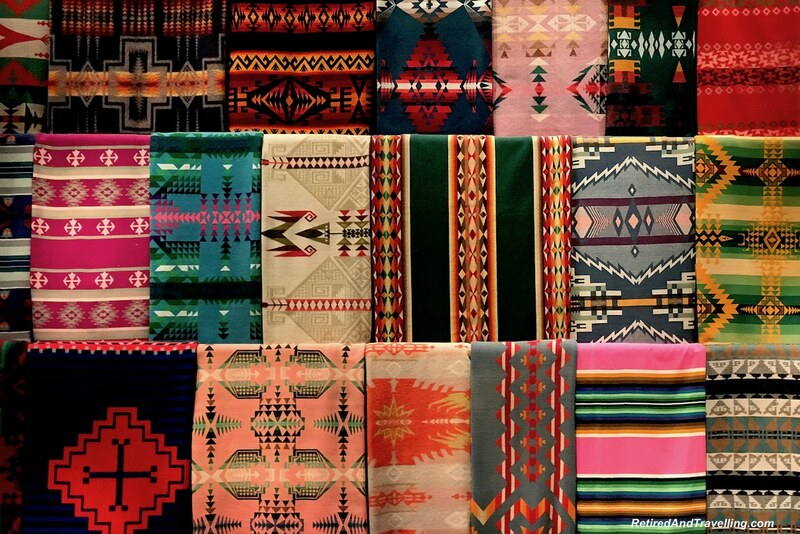 There was a full wall decorated with brightly coloured tapistries. 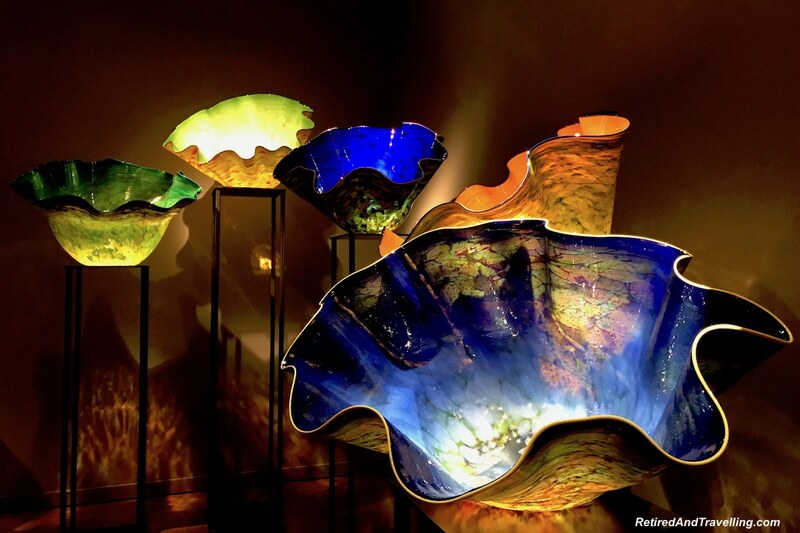 The final indoor exhibit was the Macchia Forest. 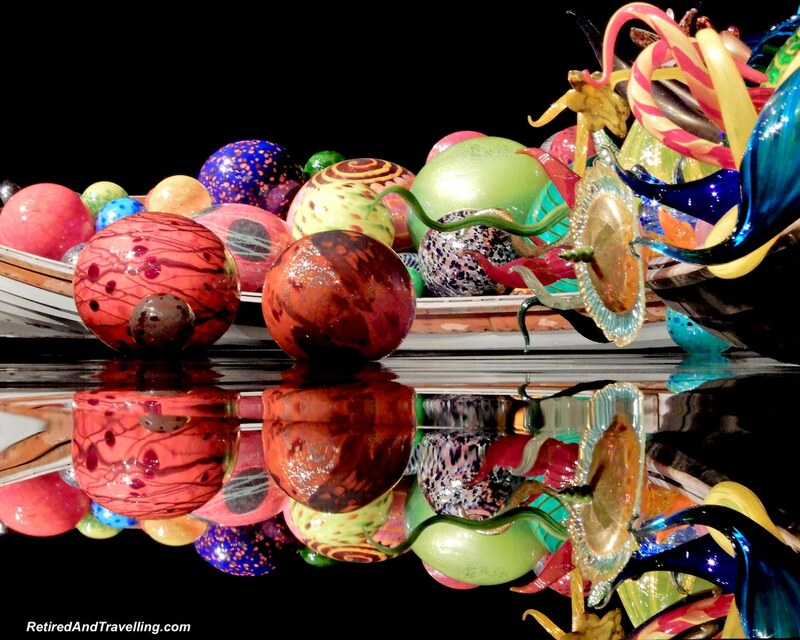 This display reminded us very much of the Murano Glass plates we had seen visiting Italy. 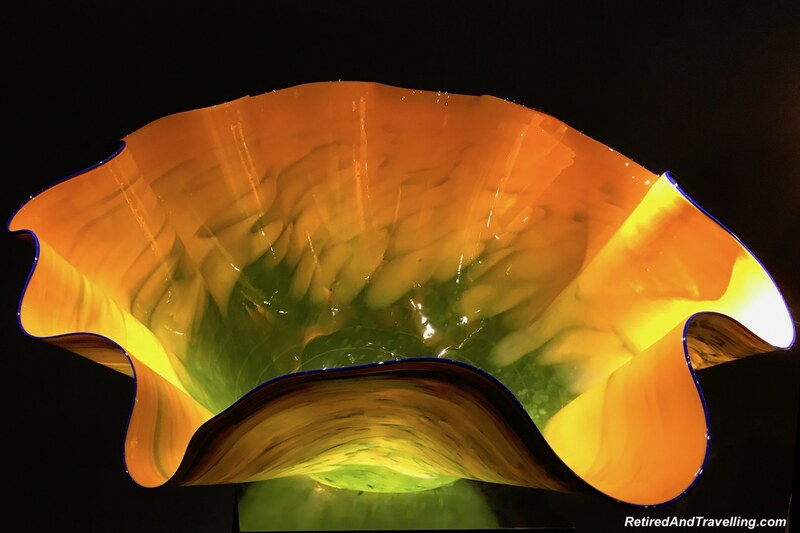 Large plates of multicolour glass was bent up to form fluted bowls. Looking into the bowls you could see the rich colours reflecting. 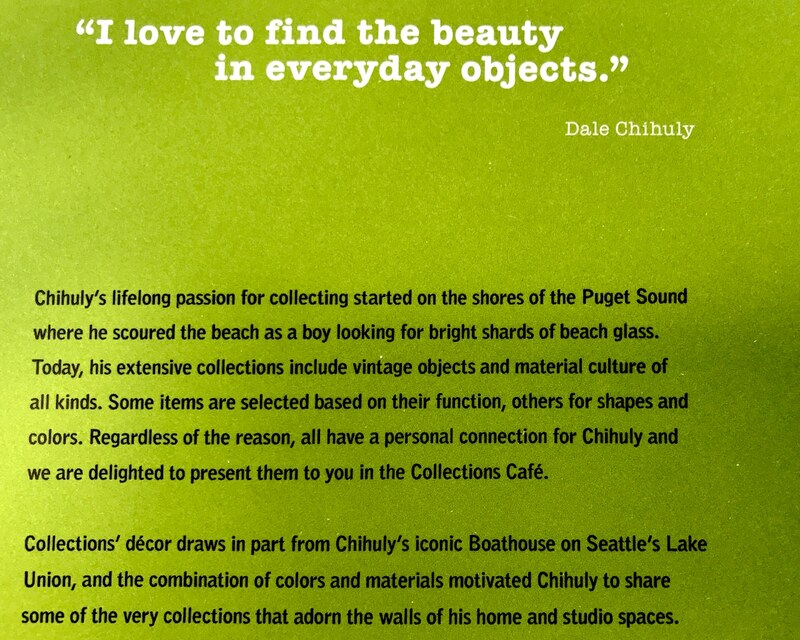 The series of exhibits were a great view of Chihuly colour and art in Seattle! We stopped an had lunch in the gardens. We had a good lunch and recovered enough to begin our walk again. Even this area was decorated with interesting art. 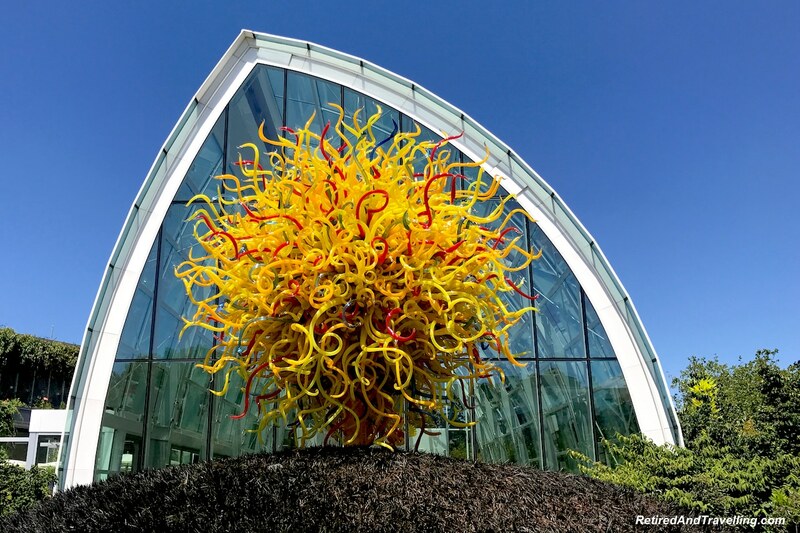 We headed next to see the outdoor displays of Chihuly colour and art in Seattle. Exiting the main building you started in the Glass House. 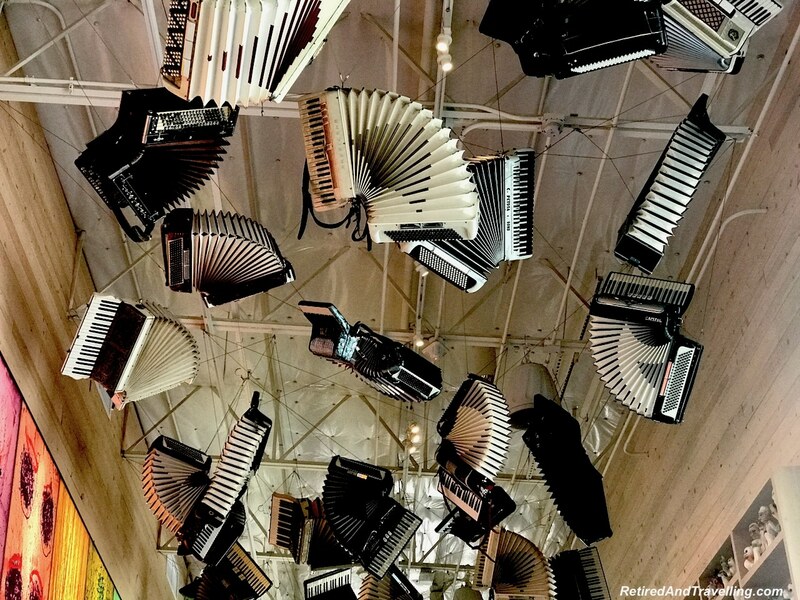 A large set of art sculptures hung from the roof overhead. 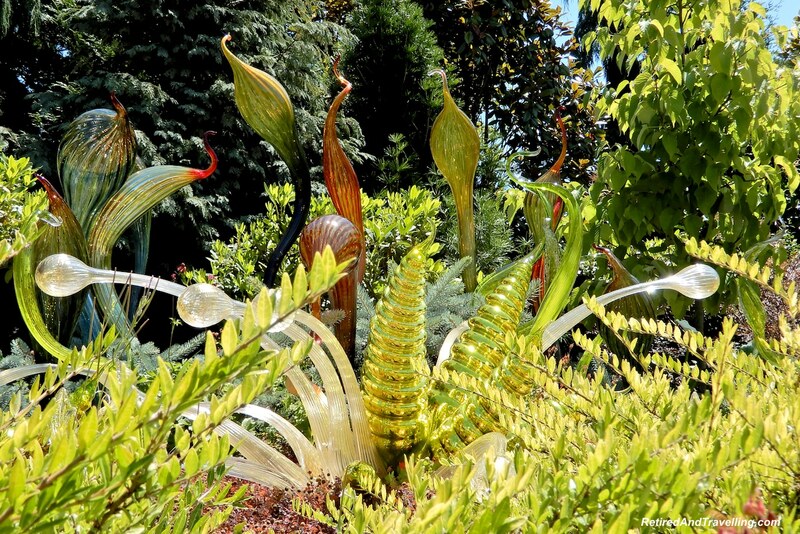 You could look out through the glass and begin to see some of the larger statues in the surrounding garden. One long outside corridor was decorated with yet more colourful chandeliers. 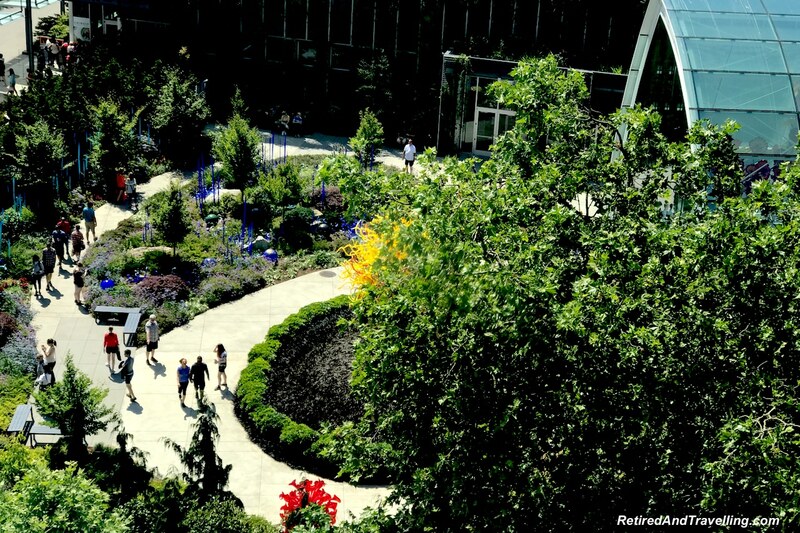 Entering the garden, we walked slowly along the path. 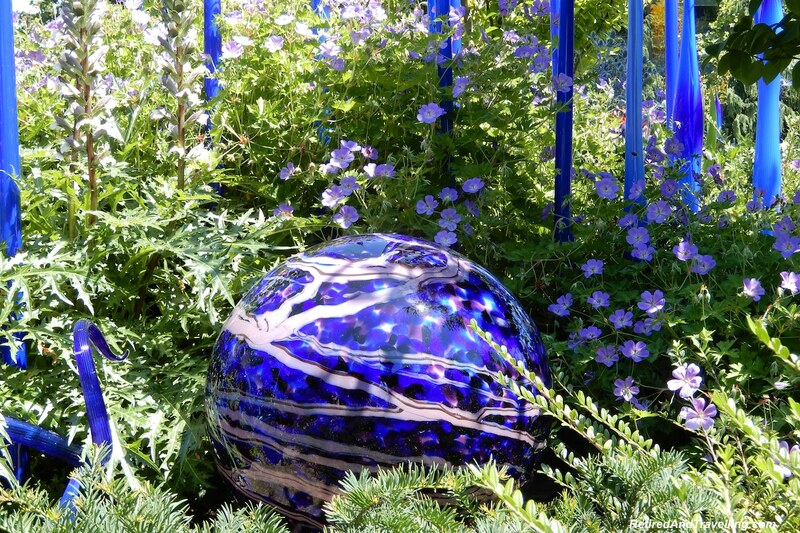 The glass work was blended in with the flowers and trees, perfectly colour balanced to the garden flowers. The sun was high and at the right angle to occasionally get a glimpse of our own reflections. 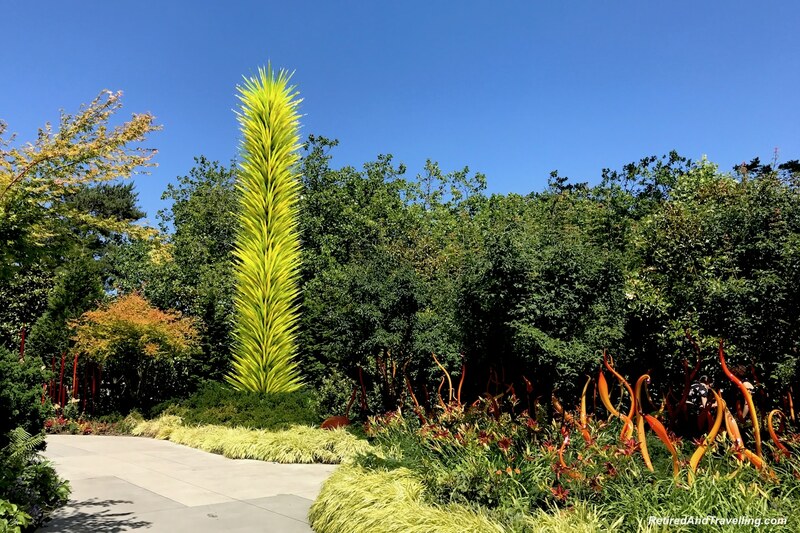 In places the gardens were the focal point with accents that came from the Chihuly colour and art in Seattle. 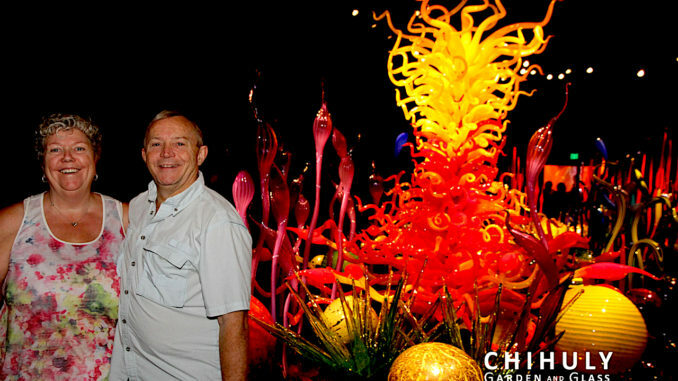 Other glass art pieces were the centre pieces and the gardens provided the accent. 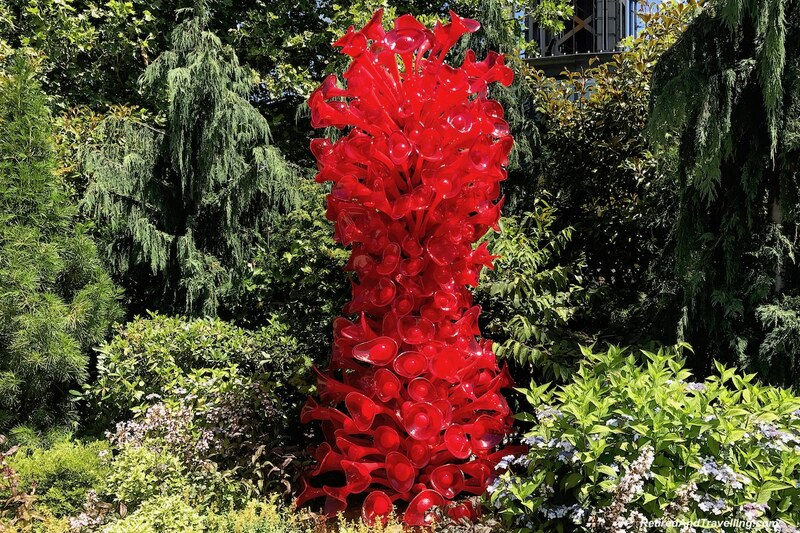 One large red glass sculpture stood out from the trees. 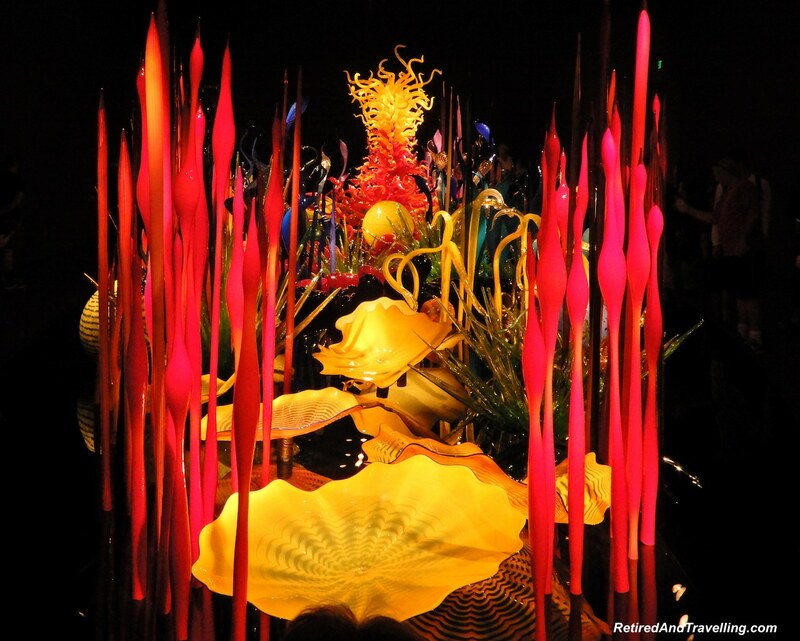 In several places there were significant glass sculptures with flowers and trees just accenting the art. There was a large yellow sculpture that looked like a hydra. 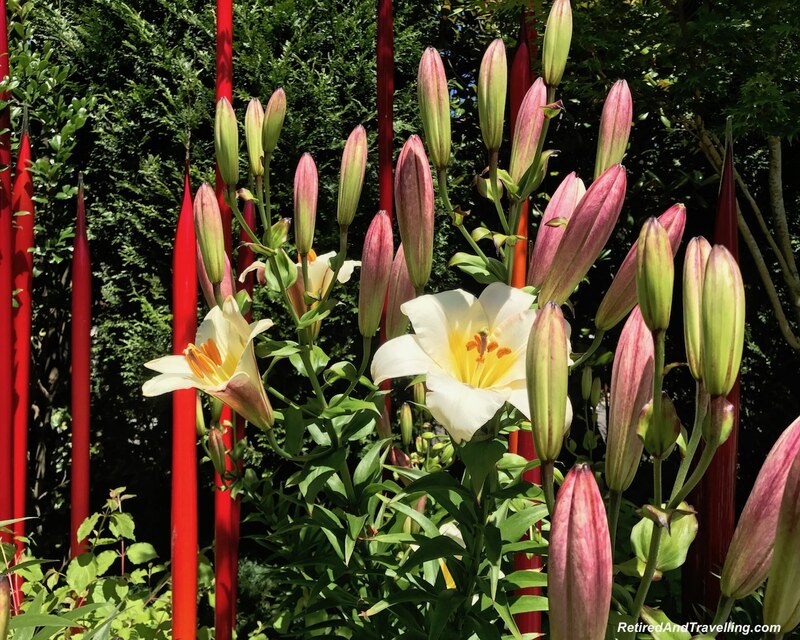 As you moved around the garden, this sculpture looked different as the light hit it in different ways. 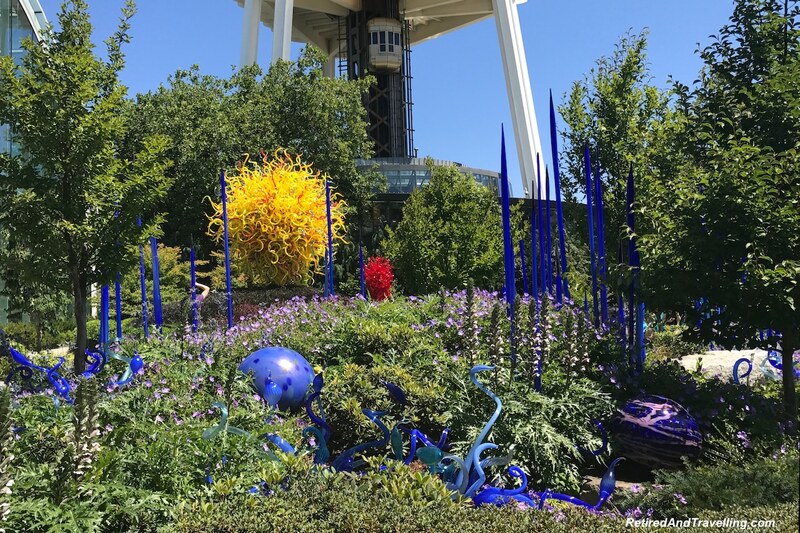 The Chihuly Exhibition is right under the Seattle Space Needle, From several vantage points, we could see the Space Needle above or the base with the elevators moving up and down. Later that day we rode up to the top of the Space Needle. 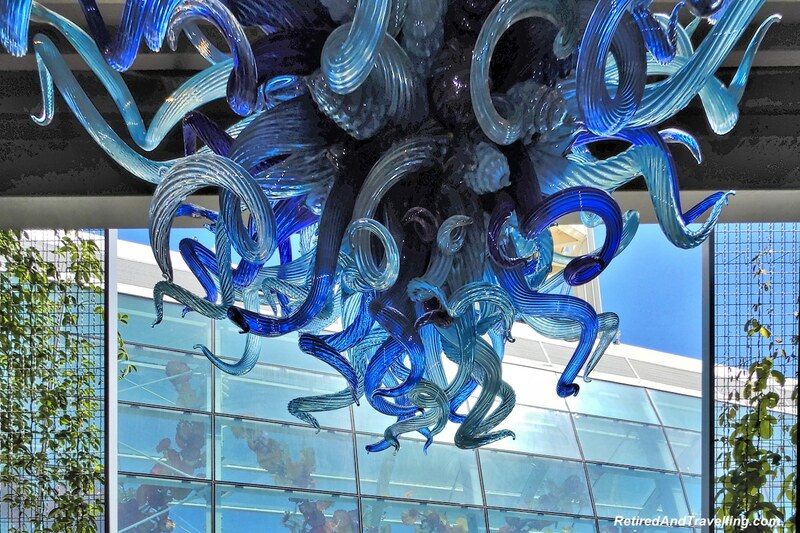 From the elevator we got a good view out over the Chihuly colour and art in Seattle. On the way out, we wandered around the gift shop. 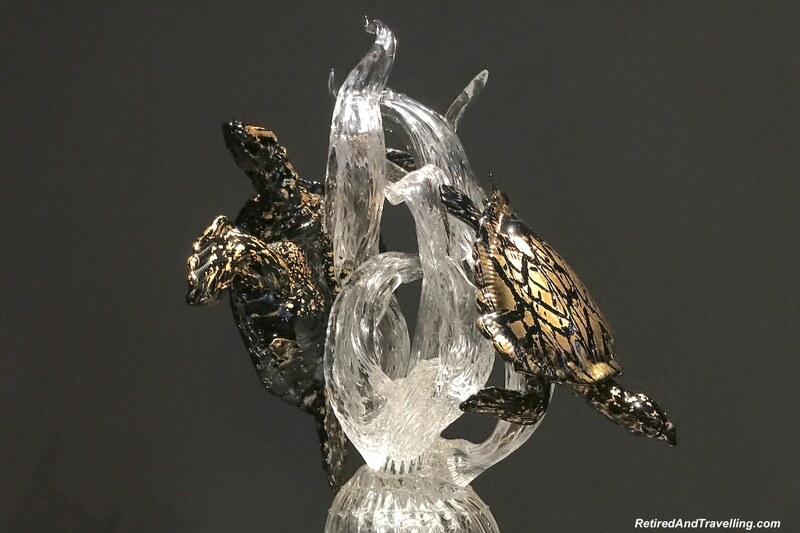 You could take home a piece of glass art. 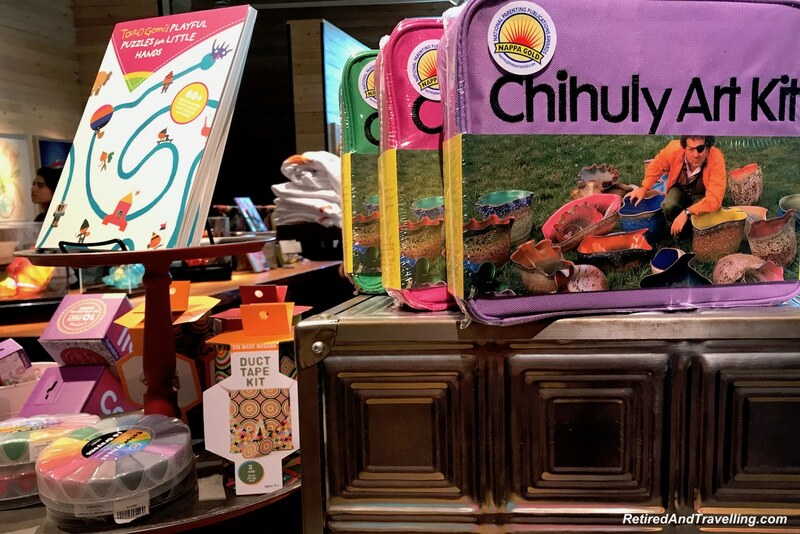 There were a large number of souvenirs in bright Chihuly colours and art books to help bring out your inner artist. 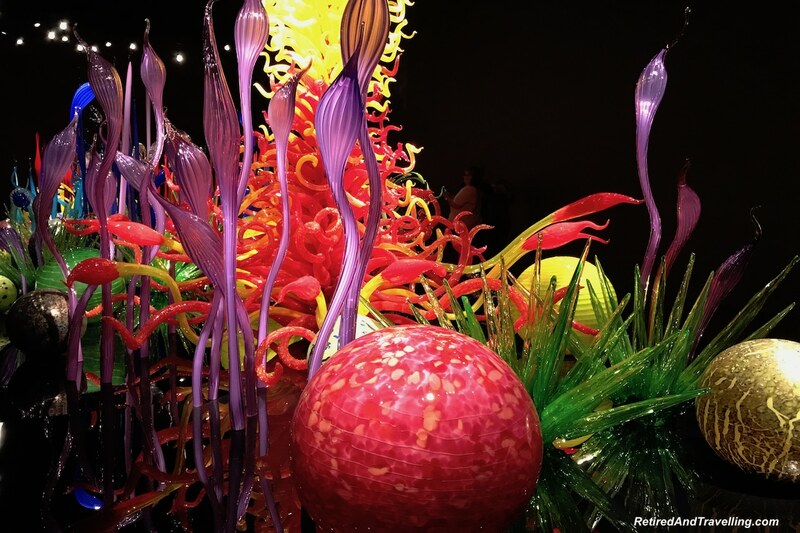 We were so glad we saw the Chihuly colour and art in Seattle. It would have been a shame to miss this second opportunity. 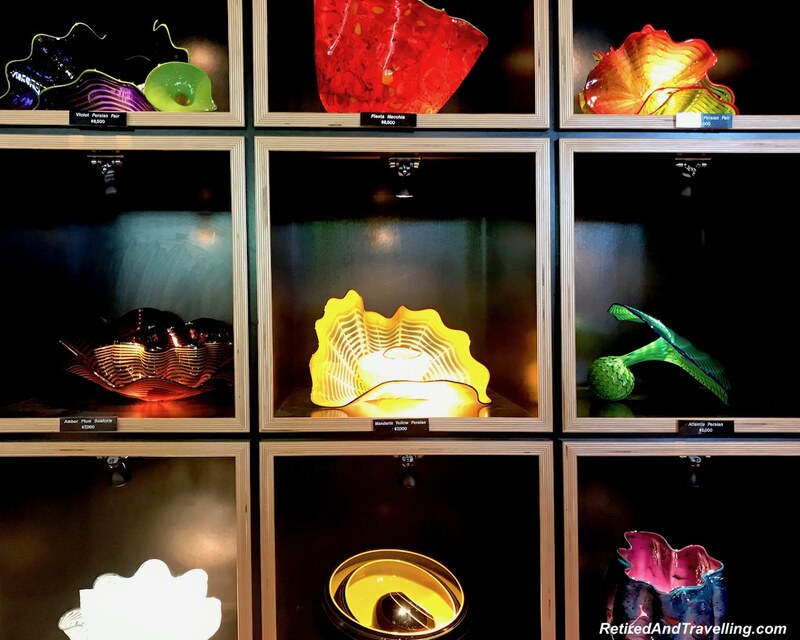 We were amazed to see the variety of ways that glass was made into art. 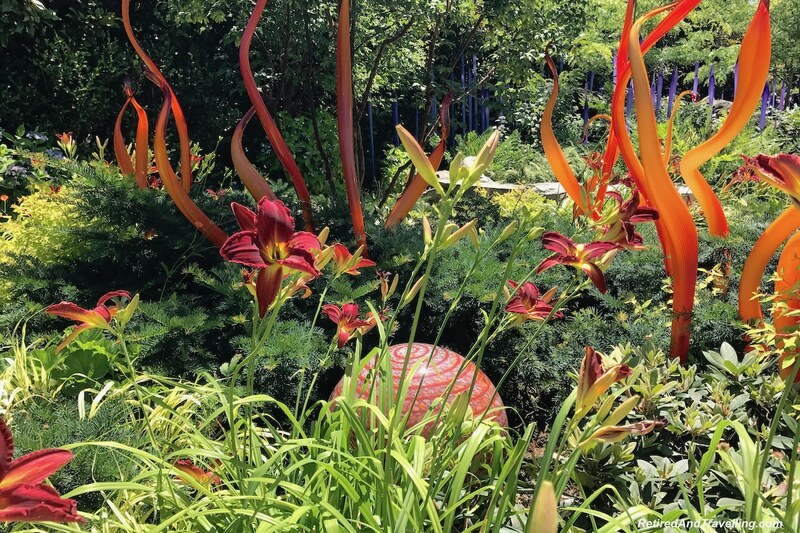 The glass art outside in the garden was magical. 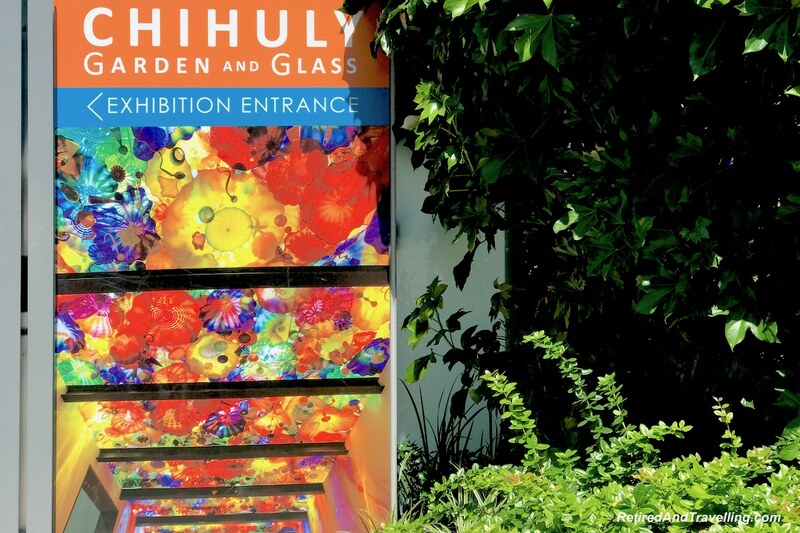 The glass was placed to highlight the colours and structure of the garden. 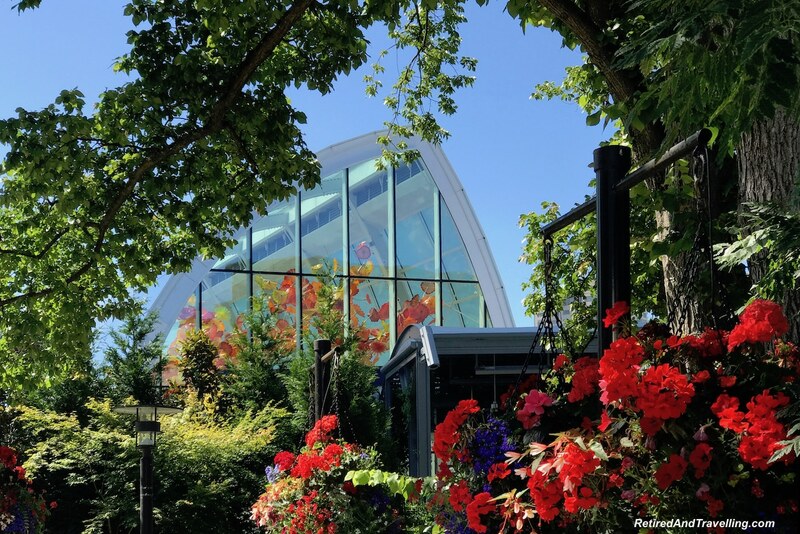 At times the garden was used to set off the glass. 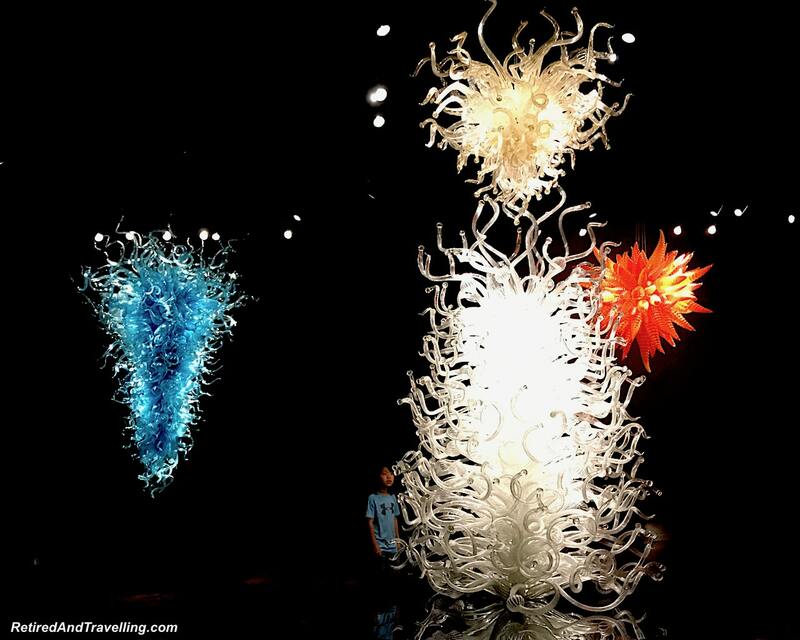 Visiting the Chihuly Exhibition was a really great way to spend half a day in Seattle. 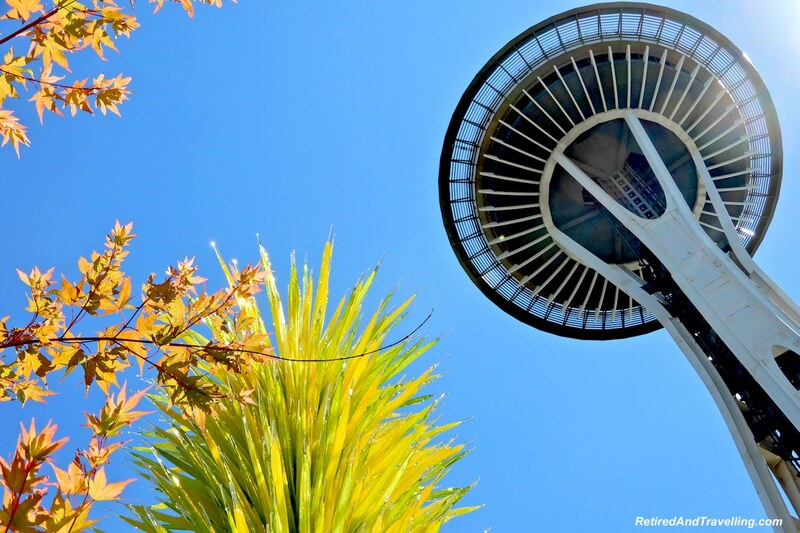 It should be on your list of things to see and do in Seattle! 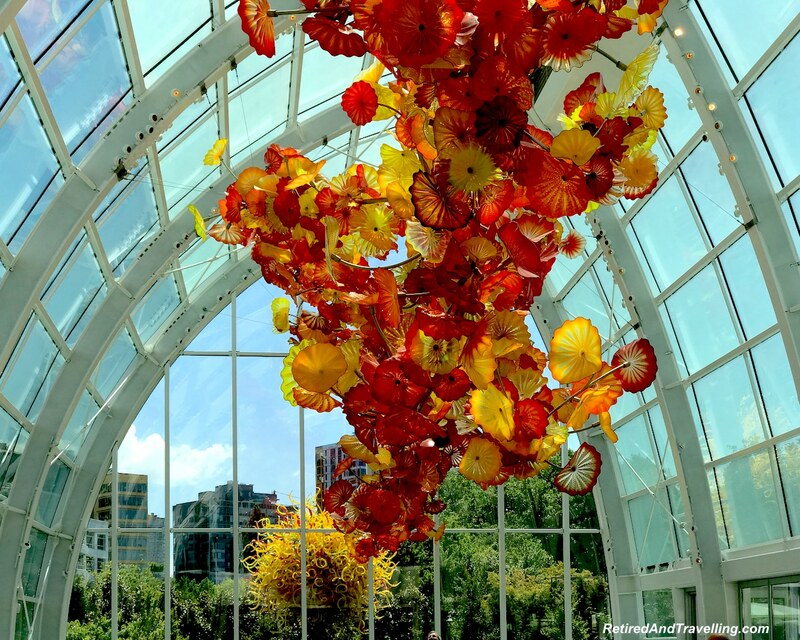 Did you see the Chihuly colour and art in Seattle? 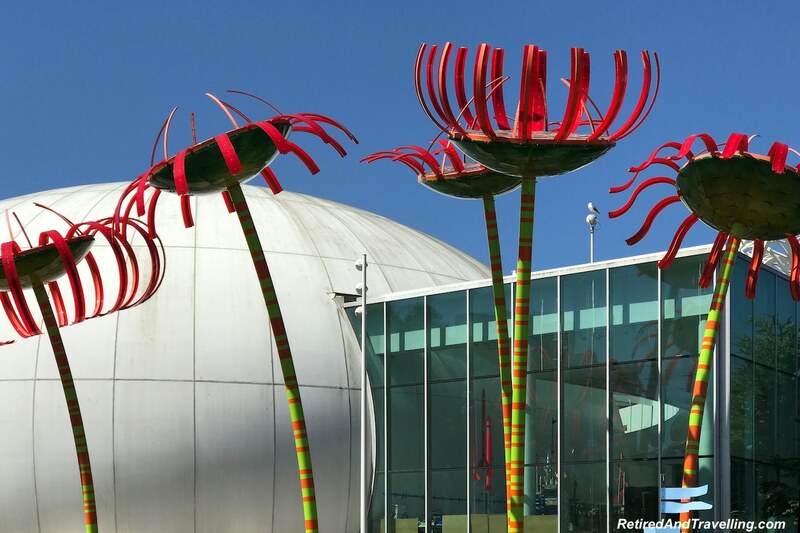 What was your favourite exhibit?